This article is about the music genre. For the Lady Gaga album, see Artpop. For the Githead album, see Art Pop. Not to be confused with Avant-pop music. Art pop is a loosely-defined style of pop music which reflects an affinity with practices in non-musical art, such as pop art, fashion, cinema, avant-garde literature, fine art, and art school studies. Drawing on postmodernism's integration of high and low culture, art pop artists deviate from both traditional rock music conventions and typical pop audiences. Central to the work of some art pop artists are explorations of artifice, the self as a construction, historical authenticity, and notions of pop as commercial art. Starting in the mid 1960s, British and American pop musicians began incorporating the ideas of the pop art movement and pseudo-symphonic textures to their recordings. English art pop musicians drew from their art school studies, while in America the style intersected with the Beat Generation and folk music's subsequent singer-songwriter movement. After its "golden age" in the 1970s, art pop's traditions would be continued in post-punk, industrial music, synthpop, and the British New Romantic scene of the 1980s. The genre further developed with artists who rejected conventional rock instrumentation and structure in favor of dance styles and the synthesizer. In the 2010s, a new era of art pop musicians drew extravagantly on visual art in their work. For more details on this topic, see Pop art. According to critic Stephen Holden, art pop often refers to any pop style which deliberately aspires to the formal values of classical music and poetry, though these works are often marketed by commercial interests rather than respected cultural institutions. Writers for The Independent and the Financial Times have noted the attempts of art pop music to distance its audiences from the public at large. The Independent's Nick Coleman wrote: "Art-pop is partly about attitude and style; but it's essentially about art. It is, if you like, a way of making pure formalism socially acceptable in a pop context. The boundaries between art and pop music became increasingly blurred throughout the second half of the 20th century. In the 1960s, pop musicians such as John Lennon, Syd Barrett, Pete Townshend, Brian Eno, and Bryan Ferry began to take inspiration from their previous art school studies. Frith states that in Britain, art school represented "a traditional escape route for the bright working class kids, and a breeding ground for young bands like the Beatles and beyond". In North America, art pop was influenced by Bob Dylan and the Beat Generation, and became more literary through folk music's singer-songwriter movement. Before progressive/art rock became the most commercially successful British sound of the early 1970s, the 1960s psychedelic movement brought together art and commercialism, broaching the question of what it meant to be an "artist" in a mass medium. Progressive musicians thought that artistic status depended on personal autonomy, and so the strategy of "progressive" rock groups was to present themselves as performers and composers "above" normal pop practice. 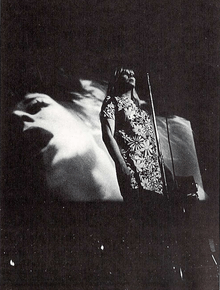 Multimedia performance of Warhol's Exploding Plastic Inevitable featuring Nico (right), 1966. "Good Vibrations" is a "majesty" of art pop by critic Ed Masley's description. Upon release, it became the group's biggest selling single. Journalist Peter Doggett also characterized "Strawberry Fields Forever" as art pop, noting its attempt to "self-consciously exclude ... the mass audience". As the dominant format of pop music transitioned from singles to albums,[nb 7] many rock bands created works that aspired to make grand artistic statements, where art rock would flourish. Wilson's unreleased Smile, conceived and recorded in 1966–67, has been described as an attempt to create "the great art pop album" and the "preeminent psychedelic pop art statement" of the era. The Who was labelled "the first pop art band" by their manager, while member Pete Townshend explains: "We stand for pop art clothes, pop art music and pop art behaviour ... we don't change offstage; we live pop art." Frith considers their album The Who Sell Out (1967) "perhaps the Pop art pop masterpiece", the Who using the "vitality" of commerce itself, a tactic echoed by Roy Wood's the Move and, later, Kevin Godley and Lol Creme's 10cc. Townshend's ideas were notable for their emphasis on commercialism: "[his] use of Pop art rhetoric ... referred not to music-making as such – to the issue of self-expression – but to commercial music-making, to issues of packaging, selling and publicizing, to the problems of popularity and stardom." Colin Larkin portrays the Beatles' 1967 album Sgt. Pepper's Lonely Hearts Club Band as "no mere pop album but a cultural icon, embracing ... pop art, garish fashion, drugs, instant mysticism and freedom from parental control. "[nb 8] Author Michael Johnson wrote that art pop music would continue to exist subsequent to the Beatles, but without ever achieving their popular success. The glam rock scene of the early 1970s would again draw widely on art school sensibilities. Glam emphasized outlandish costumes, theatrical performances, and allusions to throwaway pop culture phenomena, becoming one of the most deliberately visual phenomena to emerge in rock music. Some of its artists, like Bowie, Roxy Music, and ex-Velvet Underground member Lou Reed, would continue the practices associated with the modernist avant-garde branch of art rock. [nb 10] Bowie, a former art-school student and painter, made visual presentation a central aspect of his work, deriving his concept of art pop from the work and attitudes of Warhol and the Velvet Underground. Roxy Music is expressed by Frith as the "archetypical art pop band." 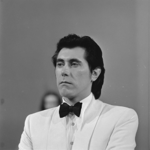 Frontman Bryan Ferry incorporated the influence of his mentor, pop art pioneer Richard Hamilton while synthesizer player Brian Eno drew on his study of cybernetics and art under theorist Roy Ascott. [nb 11] Frith posits that Ferry and Bowie remain "the most significant influences in British pop", writing they were both concerned with "pop as commercial art", and together made glam rock into an art form to be taken seriously, unlike other "camp" acts such as Gary Glitter. This redefined progressive rock and revitalized the idea of the Romantic artist in terms of media fame. According to Armond White, Roxy Music's engagement with pop art practices effectively "showed that pop's surface frivolity and deep pleasure were legitimate and commanding pursuits." After leaving Roxy Music in 1973, Eno would further explore art pop styles on a series of experimental solo albums. [nb 12] As Eno developed Warhol's arguments in a different direction from his contemporaries, he became a ubiquitous entity in 1970s pop music. Along with John Cale, Eno served a crucial part in the careers of Bowie, Talking Heads, and many key punk and post-punk records. Cultural theorist Mark Fisher characterized a variety of musical developments in the late 1970s, including post-punk, industrial music, synthpop, and particularly the work of German electronic band Kraftwerk, as situated within art pop traditions. He states that Bowie and Roxy Music's English style of art pop "culminated" with the music of the British group Japan. The Quietus characterized Japan's 1979 album Quiet Life as defining "a very European form of detached, sexually-ambiguous and thoughtful art-pop" similar to that explored by Bowie on 1977's Low. Following the amateurism of the punk movement, post-punk era saw a return to the art school tradition previously embodied by the work of Bowie and Roxy Music, with artists drawing ideas from literature, art, cinema, and critical theory into musical and pop cultural contexts while refusing the common distinction between high art and low culture. [nb 13] An emphasis on multimedia performance and visual art became common. According to The Concordian, "Running Up That Hill" was part of the most distinctive and revolutionary works of 1980s art pop, containing "darting drum rhythms" and Bush's "dogged vocals". Fisher characterized subsequent artists such as Grace Jones, the New Romantic groups of the 1980s, and Róisín Murphy as a part of an art pop lineage. He noted that the development of art pop involved the rejection of conventional rock instrumentation and structure in favor of dance styles and the synthesizer. The Quietus names English New Romantic act Duran Duran, who were formatively influenced by the work of Japan, Kraftwerk and David Bowie, as "pioneering art pop up to arena-packing level", developing the style into "a baroque, romantic escape." Critic Simon Reynolds dubbed English singer Kate Bush "the queen of art-pop", citing her merging of glamour, conceptualism, and innovation without forsaking commercial pop success during the late 1970s and 1980s. He invoked contemporary artists such as Grimes, Julia Holter, and FKA twigs as working in analogous territory to Bush. Grimes in particular was described by the Montreal Gazette as "an art-pop phenomenon" and part of "a long tradition of fascination with the pop star as artwork in progress", with particular attention drawn to role of the Internet and digital platforms in her success. Björk performing in 2003 at Hurricane Festival. Icelandic singer Björk was a prominent purveyor of art pop for her wide-ranging integration of disparate forms of art and popular culture. During the 1990s, she became art pop's most commercially successful artist. Discussing Björk in 2015, Jason Farago of The Guardian wrote: "The last 30 years in art history are in large part a story of collaborative enterprises, of collapsed boundaries between high art and low, and of the end of divisions between media. Few cultural figures have made the distinctions seem as meaningless as the Icelandic singer who combined trip hop with 12-tone, and who brought the avant garde to MTV just before both those things disappeared." West's Yeezus Tour was described by Forbes as "the current mass cultural phenomenon best described as 'artpop.'" According to Barry Walters of NPR, 1990s rap group P.M. Dawn developed a style of "kaleidoscopic art-pop" that was initially dismissed by hip hop fans as "too soft, ruminative and far-ranging" but would eventually pave the way for the work of artists like Drake and Kanye West. In 2013, Spin noted a "new art-pop era" in contemporary music, led particularly by West, in which musicians draw on visual art as a signifier of wealth and extravagance as well as creative exploration. Fact labels West's 2008 album 808s & Heartbreak as an "art-pop masterpiece" which would have a substantive influence on subsequent hip hop music, broadening the style beyond its contemporary emphasis on self-aggrandizement and bravado. The New York Times writer Jon Caramanica described West's "thought-provoking and grand-scaled" works as having "widened [hip hop]'s gates, whether for middle-class values or high-fashion and high-art dreams." ↑ Historically, "art rock" has been used to describe at least two related, but distinct, types of rock music. The first is progressive rock, while the second usage refers to groups who rejected psychedelia and the hippie counterculture in favor of a modernist, avant-garde approach defined by the Velvet Underground. ↑ "If postmodernism means a breakdown of high/low cultural boundaries, it means too the end of this historical myth – which is where the art-pop musicians come in, complicating sociological readings of what music means, putting into play their own accounts of authenticity and artifice." ↑ Musicologist Allan Moore surmises that the term "pop music" itself may have originated from Pop art. ↑ When the Velvet Underground first appeared in the mid 1960s, they faced rejection and were commonly dismissed as a "fag" band. ↑ Through their influential work, Wilson and the Beatles' George Martin spread the idea of the recording studio as a musical instrument used to aid the process of composition. Author Michael Johnson credits the Beach Boys' Pet Sounds (1966) and the Beatles' Sgt. Pepper's Lonely Hearts Club Band (1967) as the first documented "ascension" of rock and roll. Spector has also been credited by journalist Richard Williams with transforming rock music as a performing art to an art which could only exist in the recording studio, which "paved the way for art rock". ↑ The Beach Boys were virtually disconnected from the cultural avant-garde, according to biographer Peter Ames Carlin, who concluded that – with the possible exception of Wilson – they "had [not] shown much discernible interest in what you might call the world of ideas." ↑ The Beatles, the Beach Boys, Phil Spector, and Frank Zappa all indicated a direction that transformed long-playing records into a creative format while variously reciprocating each others' creative developments throughout the 1960s. ↑ Composer Frank Zappa targeted the issue of pop commercialism with the cover of the Mothers of Invention's 1968 album We're Only in It for the Money, which parodied the cover of Sgt. Pepper's. ↑ Other students of the center included Laurie Anderson, Suicide's Alan Vega, and Blondie's Chris Stein. ↑ Scholar Philip Auslander noted a pattern with artists who irreverently plundered older styles of music, such as Brill Building and Spector's Wall of Sound. Producer Tony Visconti remembers that in 1970, he, Bowie, and T. Rex's Marc Bolan would "get high and listen to Beach Boys albums and Phil Spector albums – we all had that in common, that we loved the Beach Boys." ↑ Eno's initial musical influences were ideas from the classical avant-garde, like John Cage's indeterminacy, La Monte Young's minimalism, and the Velvet Underground — specifically the band's John Cale. ↑ Eno's 1970s work is cited by musicologist Leigh Landy as an archetypal example of a pop musician who "applied developments from the experimental sector while creating their own experimental pop sector". ↑ Among major influences on a variety of post-punk artists were postmodern novelists such as William S. Burroughs and J.G. Ballard and avant-garde political movements such as Situationism and Dada. Additionally, in some locations the creation of post-punk music was closely linked to the development of efficacious subcultures, which played important roles in the production of art, multimedia performances, fanzines related to the music. Simon Reynolds would note: "Beyond the musicians, there was a whole cadre of catalysts and culture warriors, enablers and ideologues who started labels, managed bands, became innovative producers, published fanzines, ran hipster record stores, promoted gigs and organized festivals." 1 2 3 4 5 6 7 8 9 10 11 12 13 14 15 Holden, Stephen (February 28, 1999). "MUSIC; They're Recording, but Are They Artists?". The New York Times. Retrieved July 17, 2013. 1 2 Frith & Horne 2016, p. 74. 1 2 3 4 Buckley 2012, p. 21. 1 2 3 4 5 6 Fisher, Mark (2010). "You Remind Me of Gold: Dialogue with Simon Reynolds". Kaleidoscope (9). 1 2 3 4 5 6 Fisher 2014, p. 5. 1 2 Bannister 2007, p. 184. 1 2 3 4 5 6 7 8 Fisher, Mark (November 7, 2007). "Glam's Exiled Princess: Roisin Murphy". Fact. London. Archived from the original on November 10, 2007. Retrieved November 23, 2015. ↑ Frith 1989, p. 116, 208. 1 2 Lester, Paul (11 June 2015). "Franz and Sparks: this town is big enough for both of us". The Guardian. 1 2 Shepherd, Julianne Escobedo. "Pop for Art's Sake Goes Varoom!". Spin Magazine. Retrieved 25 July 2016. ↑ Frith 1989, p. 97. 1 2 3 4 5 6 Frith 1989, p. 208. 1 2 White, Armond. "The Best of Roxy Music Shows Ferry's Talent for Exploring Pop While Creating It". Retrieved March 15, 2016. ↑ DJ Taylor (August 13, 2015). "Electric Shock: From the Gramophone to the iPhone: 125 Years of Pop Music by Peter Doggett, book review". The Independent. Retrieved March 15, 2016. 1 2 Aspden, Peter. "The Sound and Fury of Pop Music." Financial Times. 14 August 2015. ↑ Coleman, Nick (31 August 2003). "Live Box". The Independent. Independent Print Limited. ↑ Frith & Horne 2016, p. 100. ↑ Edmondson 2013, p. 1233. 1 2 Frith & Horne 2016, p. 99. ↑ Frith & Horne 2016, pp. 74, 99–100. ↑ Frith & Horne 2016, p. 103. ↑ Frith & Horne 2016, p. 108. ↑ Bannister 2007, pp. 44–45. ↑ Masley, Ed (October 28, 2011). "Nearly 45 years later, Beach Boys' 'Smile' complete". Arizona Central. ↑ Edmondson 2013, p. 890. 1 2 Johnson 2009, p. 197. ↑ Bannister 2007, pp. 38, 44–45. 1 2 Davis, Erik (November 9, 1990). "Look! Listen! Vibrate! SMILE! The Apollonian Shimmer of the Beach Boys". LA Weekly. Archived from the original on December 4, 2014. Retrieved 14 January 2014. ↑ Himes, Geoffrey. "Surf Music" (PDF). teachrock.org. Rock and Roll: An American History. ↑ Christensen, Thor (June 25, 2015). "Concert review: Former Beach Boy Brian Wilson shines with 11-member band at the Verizon Theatre". Guide Live. ↑ Carlin 2006, p. 62. ↑ Richardson, Mark (November 2, 2011). "The Smile Sessions review". Pitchfork. Retrieved July 16, 2013. ↑ Staton, Scott (September 22, 2005). "A Lost Pop Symphony". The New York Review of Books. Retrieved September 12, 2013. 1 2 3 Frith & Horne 2016, p. 101. ↑ Larkin, Colin (2006). Encyclopedia of Popular Music. 1. Muze. pp. 487–489. ISBN 0-19-531373-9. 1 2 3 Frith & Horne 2016, pp. 113–114. 1 2 Molon & Diederichsen 2007, p. 73. ↑ Auslander 2006, pp. 55, 86, 179. ↑ Curtis 1987, p. 263. ↑ Cavna, Michael. "Beyond the music: How David Bowie was one of our smartest visual artists". The Washington Post. Retrieved 14 March 2016. ↑ Jones, Jonathan. "David Bowie and the sexual stamina of Dorothy Iannones – the week in art". The Guardian. Retrieved 5 March 2016. ↑ Walker, John. (1987) "Bryan Ferry : music + art school". Cross-Overs: Art into Pop, Pop into Art. ↑ Shanken, Edward (2002). "Cybernetics and Art: Cultural Convergence in the 1960s" (PDF). responsivelandscapes.com. ↑ Frith & Horne 2016, p. 117. 1 2 Frith & Horne 2016, p. 116. ↑ Heller, Jason (June 14, 2012). "Getting started with Brian Eno, glam icon and art-pop pioneer". The A.V. Club. Chicago. Retrieved July 17, 2013. ↑ Landy 2013, p. 167. ↑ Fisher 2014, p. 36. ↑ Burnett, Joseph. "Thirty Years On: Japan's Oil On Canvas Revisited". The Quietus. Retrieved 14 March 2016. ↑ Rojek 2011, p. 28. ↑ Anindya Bhattacharyya. "Simon Reynolds interview: Pop, politics, hip-hop and postpunk" Socialist Worker. Issue 2053, May 2007. 1 2 Reynolds 2006, p. xxxi. ↑ Reynolds 2006, p. 7. ↑ Reynolds 2006, p. 29. ↑ Cashen, Calvin (March 8, 2016). "Top art pop albums of the '80s". The Corncordian. 1 2 Reynolds, Simon. "Kate Bush, the queen of art-pop who defied her critics". The Guardian. Retrieved 5 March 2016. ↑ O'Mara, Jamie. "Grimes's star shines online". Montreal Gazette. Retrieved 12 March 2016. ↑ Hermes, Will (23 January 2015). "Vulnicura Album Review". Rolling Stone. Wenner Publishing. Archived from the original on March 25, 2016. Retrieved 6 March 2016. 1 2 "Björk's Been ARTPOP Since Before Gaga Was Born This Way". The Huffington Post. 17 July 2013. Retrieved 2 January 2016. ↑ Hunter, James (October 1997). "Björk – Homogenic". Spin. Vol. 13 no. 7. Spin Media. ISSN 0886-3032. Retrieved 6 March 2016. ↑ Farago, Jason (4 March 2015). "Björk review – a strangely unambitious hotchpotch". theguardian.com. Retrieved 4 March 2015. ↑ Greenburg, Zack O'Malley. "Kanye West Makes His Own Artpop On Yeezus Tour". Forbes. Retrieved 25 July 2016. 1 2 Walters, Barry. "Dev Hynes Wants To Know What It Feels Like To Be Free". NPR. Retrieved 22 August 2016. ↑ Twells, John. "Drake: Thank Me Later". Fact Magazine. Retrieved 25 July 2016. ↑ Caraminica, Joe (June 11, 2013). "Behind Kanye's Mask". The New York Times. ↑ Stannard, Joseph (October 13, 2010). "Are You Normal? 10cc's Graham Gouldman Interviewed". The Quietus. ↑ Pareles, Jon. "Anohni: Embracing a New Name, and Sound". New York Times. Retrieved 5 May 2016. ↑ Howe, Brian (August 24, 2010). "Thank You For Your Love EP". Pitchfork. ↑ Sawdey, Evan. "Dance This Mess Around The B-52's - "Lava"". PopMatters. Retrieved 28 October 2016. ↑ Joyce, Colin (20 October 2015). "Dean Blunt Goes on a Trip for 'On Wine, Hashish & Molly' Version of Archangel's 'Julia'". Spin. Retrieved 22 February 2016. ↑ Fisher 2014, p. 4. ↑ Plagenhoef, Scott (5 October 2003). "Belle and Sebastian: Dear Catastrophe Waitress". Pitchfork Media. Retrieved 1 March 2016. ↑ Simon Reynolds. "Kate Bush, the queen of art-pop who defied her critics". the Guardian. ↑ Snapes, Laura. "Christine and the Queens Can't Stop Googling Weird Diseases". Pitchfork Media. Retrieved 22 August 2016. ↑ Aston, Martin. "Devo: Where Are They Now?" Q, October 1995. ↑ "Grime's Star Shines Online". Montreal Gazette. ↑ Howe, Brian. "The 100 Best Tracks of 2015". Pitchfork Media. Retrieved 28 October 2016. ↑ Brodsky, Rachel. "Jenny Hval to Release New Album, Shares 'Female Vampire'". Spin Magazine. Retrieved 25 July 2016. ↑ Reynolds 2006, p. 127. ↑ Pelly, Jenn. "Zola jesus". Pitchfork Media. Retrieved 28 October 2016. ↑ "Grey area: Chris Petit's Content". bfi.org.uk. ↑ Wheeler, Brad (October 4, 2013). "In an age of manufactured stars, Lorde is a refreshing change". theglobeandmail.com. ↑ Sendra, Tim. "Majical Cloudz". AllMusic. Retrieved March 6, 2016. ↑ Johnston, Maura. "Dirty Projectors, Solange Knowles, and the Perils of Music-Racism". Village Voice. Retrieved 28 October 2016. ↑ Hodges, Taylor (2015-04-02). "A Guide to Moloko Star Róisín Murphy's 10 Best Songs". Electronic Beats. Retrieved 2015-07-17. ↑ Wood, Mickael (December 2006). "Strange Beauty". Spin: 95. Retrieved 29 October 2016. ↑ Lindsay, Cam. "Pet Shop Boys A Life in Pop". Exclaim!. Retrieved 28 October 2016. ↑ Reynolds, Simon. "Odd Future, Wiz Khalifa, and the Internet-Rap Atomization". Pitchfork. ↑ Julious, Britt. "How We Walk on the Moon: Arthur Russell's Quiet Genius". Noisey. Retrieved 28 October 2016. ↑ "Beyond Bowie: The mutating art-pop of Sparks in 10 records". thevinylfactory.com. ↑ Siegel, Evan (February 10, 2016). "Avant-Pop Pioneer Spookey Ruben Conducts a Synth Symphony on 'Granma Faye'". Spin. ↑ "St. Vincent". Time Out. Retrieved 28 October 2016. ↑ "Stereolab Reveal Vinyl Reissues of 'Emperor Tomato Ketchup' and 'Dots and Loops'". exclaim.ca. ↑ "The Lost Generation". Pitchfork. ↑ Hudson, Alex. ""Water Fountain" (live on 'Fallon')". Exclaim!. Retrieved 28 October 2016. Buckley, David (2012). Strange Fascination: David Bowie: The Definitive Story. Random House. ISBN 1-4481-3247-9. Curtis, James M. (1987). Rock Eras: Interpretations of Music and Society, 1954–1984. Popular Press. ISBN 978-0-87972-369-9. Molon, Dominic; Diederichsen, Diedrich (2007). Sympathy for the Devil: Art and Rock and Roll Since 1967. Yale University Press. ISBN 978-0-300-13426-1. Frith, Simon (1989). Facing the Music: A Pantheon Guide to Popular Culture. Pantheon Books. ISBN 0-394-55849-9. Reynolds, Simon (2006). Rip It Up and Start Again: Postpunk 1978–1984. Penguin Publishing Group. ISBN 978-1-101-20105-3.